Which team would this fresh-faced starlet improve? Which player from your club's past does the current-day team most need? Each day this week, from Monday to Friday, we'll be looking at a different four Premiership clubs, working through the full 20 in alphabetical order. The assumption is that the player in question is at the peak of their powers and could cope with the fitness demands of the modern day game. There is an argument that Arsene Wenger could receive no better present than a 29-year-old David Seaman. This would solve his goalkeeping worries at a stroke and provide part of a much-needed spine to the team. But it is in front of Seaman that Arsenal most need help. With Martin Keown and Sol Campbell struggling with injury and Pascal Cygan a trundling liability, a centre-half with leadership skills is needed. With apologies to Frank McLintock and Willie Young, there is only one man for the job - Tony Adams. If you wanted to be fussy, you would go for the 1998 version - a wiser head on those broad shoulders, free of alcoholism and enjoying the fruits of the Wenger revolution. Either way you'd back Adams to sort out Arsenal's current defensive malaise and drag the very best from the players around him. Villa fans with their fingers in the history books will push the case of legendary goalkeeper Sam Hardy, who made 182 appearances for the club from May 1912. There would be no Enckelman-esque errors from Hardy, who redefined the art of goalkeeping in his tenure as England's no.1 from 1907-21. But Villa's biggest problem this season has been scoring goals - so a striker is the main priority. Harry Hampton (242 goals in 376 games) has the most impressive record, but those goals were scored at the very start of the last century. Peter McParland (341 games, 120 goals) won the FA Cup for Villa in 1957 but was as much winger as centre-forward, which leaves us with a choice of four. Pongo Wearing - known as "the Gay Cavalier" didn't score enough goals, while Andy Gray is only edged out by the quality of competition. The combative Peter Withe - 90 goals in 200 games, including 20 the season Villa last won the championship, and the winner in the 1981 European Cup - will consider himself unlucky to miss out. But who could argue with Billy Walker's 244 goals in 531 games, including 12 hat-tricks? Captain of both Villa and England, he would grace the current-day Villa side. There are those who would argue that Frank Worthington could add some much-needed inspiration to Steve Bruce's side. To that there is just one response: Christophe Dugarry. A club only needs one unreliable glamourpuss at any one time. 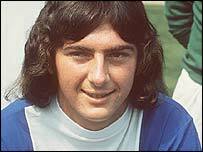 No, the man to save City would be Trevor Francis - very much in his playing days rather than his less successful managerial guise. Francis' pace and goal-scoring ability are exactly what Birmingham are crying out for. With all respect to Stern John, Clinton Morrison and Geoff Horsfield, the current Blues attack could only benefit from a player of Francis' class. Graeme Souness's side have won plenty of plaudits for their ability to beat superior sides through hard work and application of sound tactics. But just imagine what they could do if they had a striker capable of 30 goals a season. Alan Shearer might only have played 165 games in his four years there, having lost too many to injury. But what an impact he made. Without Shearer there would have been no Premiership win in 1995, no adventures (albeit short) in the Champions League. The Shearer of 1994-5 could transform Rovers from the steady eddies of the top flight into genuine contenders for another Champions League place. On Tuesday we'll be taking a look at which old boys would most improve Bolton, Charlton, Chelsea and Everton.